On Saturday, we are hosting our first Park Volunteer Day of the year! Join us on Saturday, 9 a.m. – 12 p.m. to help spruce up the park. 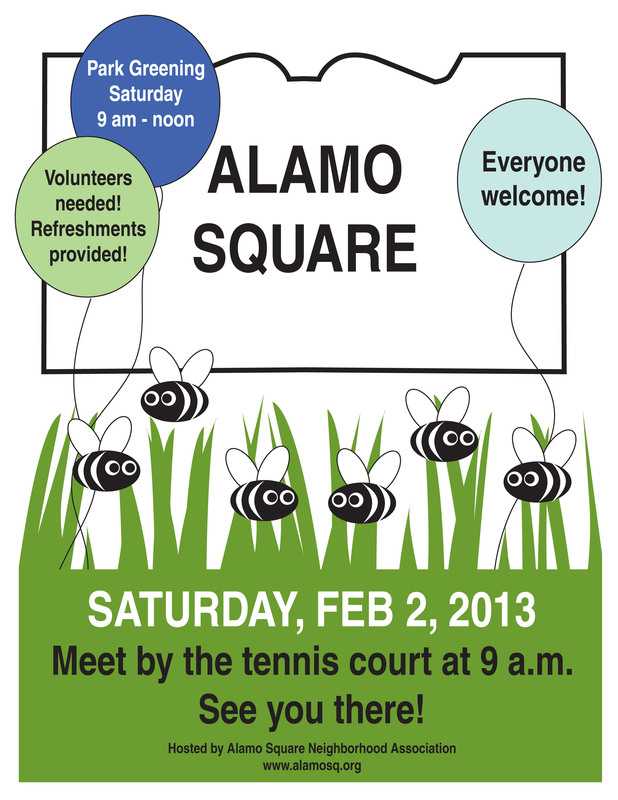 Please email us at park@alamosq.org if you plan on joining us so we can plan the activities for the day. Also, our monthly Alamo Square Playgroups returns on Sunday, February 3, 10 a.m. – 12 p.m. Meet other parents and their kids ages 0-3. We hope you can join us! 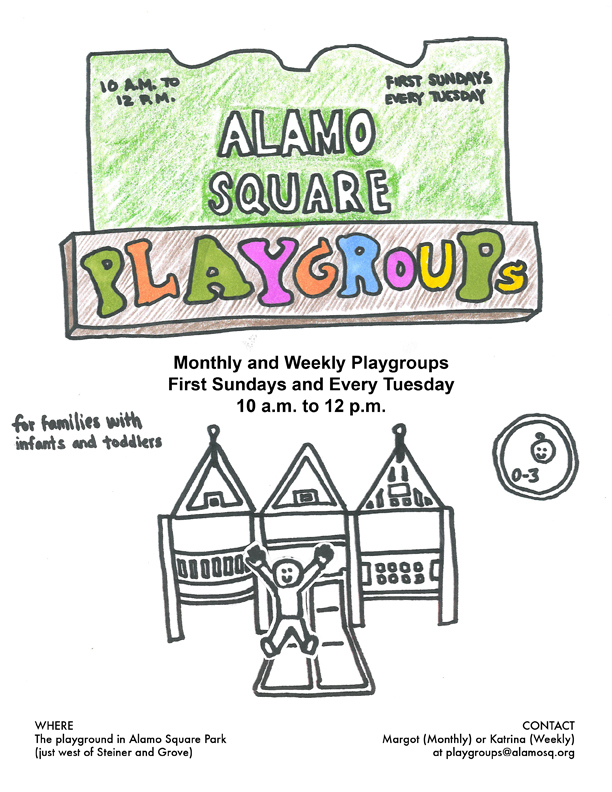 Our weekly Alamo Square Playgroups meets every Tuesday, 10 a.m. – 12 p.m.
A parking spot of one’s own? OPINION — Parking is a city-wide problem. It’s why I sold my car back in 2006 (after a few parking tickets, a fender bender and an unfair tow-away). Then there’s those of us without a car. If I rent a car to run errands or to take a trip, I have to either pay a larger per-day fee for a short-term pass, or suffer the wrath of SFDPT. I’m being penalized for not having my own automobile. 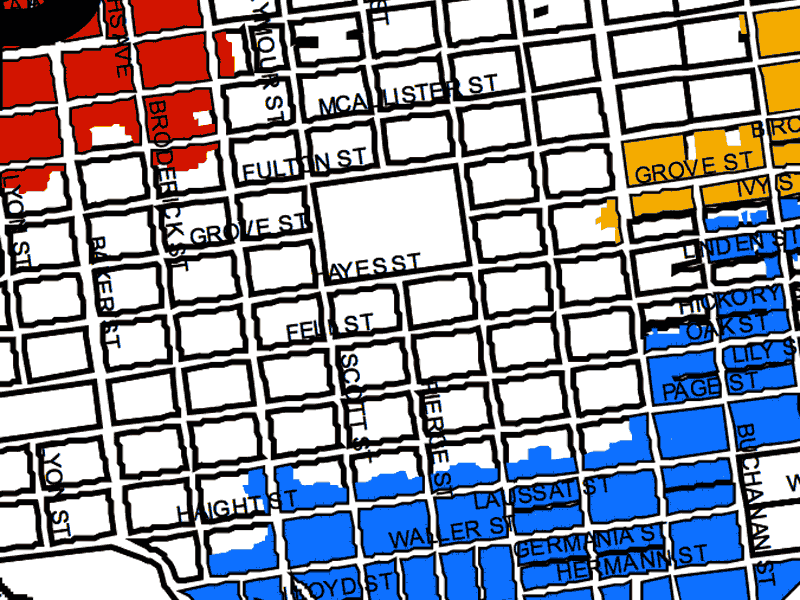 Of the 22,600 households in District 5, 10,000 have no vehicles; some by choice, others by necessity. Of the residents with employment, 32% drive their car to work, and 41% take transit instead. Parking is free in our neighborhood. It makes it possible to have long-term visitors without worrying about running over the RPP time limit. I support finding alternate solutions to our parking problem, including the addition of angled parking, and I encourage those of us who can manage without a car to consider that solution as well. • Others outside the neighborhood park here for free and use employee shuttle buses, Muni, etc. *P.S. $104 is the maximum fee allowed by the state; Also contrary to the North Panhandle Newsletter, ASNA has not taken a position for or against RPP. http://alamosquare.org/wp-content/uploads/2016/10/ASNA-logo-282x300.png 0 0 admin http://alamosquare.org/wp-content/uploads/2016/10/ASNA-logo-282x300.png admin2013-01-19 13:09:562013-01-19 13:09:56A parking spot of one's own? You’re invited! Hope to see you at our Alamo Square Potluck and General Meeting. 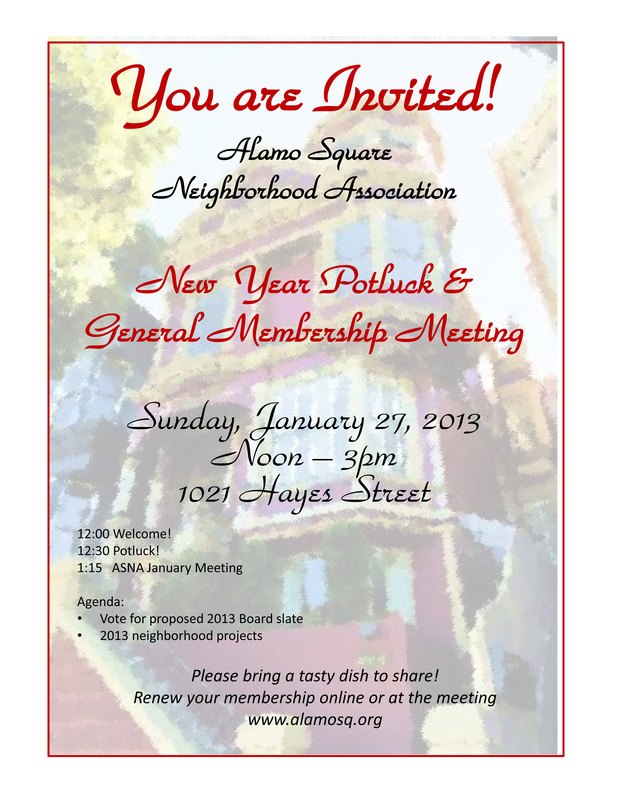 Vote for the 2013 ASNA Board of Directors, enjoy some delicious food with neighbors, and learn about what’s in store in 2013 for Alamo Square!